A 30-year-old man presents to his physician for a follow-up appointment for a blood pressure of 140/90 mm Hg during his last visit. He was advised to record his blood pressure at home with an automated device twice every day. He recorded a wide range of blood pressure values in the past week, ranging from 110/70 mm Hg to 135/84 mm Hg. The medical history is unremarkable and he takes no medications. He occasionally drinks alcohol after work, but denies smoking and illicit drug use. Which of the following factors is responsible for maintaining a near-normal renal blood flow over a wide range of systemic blood pressures? A 33-year-old woman visits an outpatient clinic for the first time after moving to the US from Peru a few months ago. She complains of easy fatigability and shortness of breath with minimal exertion for the past 6 months. She further adds that her breathlessness is worse when she goes to bed at night. She is also concerned about swelling of both her legs. As a kid, she says she always had sore throats. She does not smoke or drink alcohol. Past medical records are unavailable but the patient says that she has always been healthy apart from her sore throats. Her blood pressure is 114/90 mm Hg, pulse is 109/min, respirations are 26/min and temperature is 36.7°C (98°F). On examination, she is icteric with distended jugular veins. Bilateral basal crepitations are audible on auscultation of the lungs. Also, a high-pitched apical holosystolic murmur is audible that radiates to the left axilla. A transthoracic echocardiogram reveals mitral regurgitation with an ejection fraction of 25%. Which of the following is the principle of treatment of this patient’s condition? A 45-year-old man walks into an urgent care clinic complaining of a headache and dizziness. Earlier today he was in his normal state of health when symptoms started and lasted about 20 minutes. He did not lose consciousness or actually vomit. He also mentions that he was sweating a lot at that time. He has had similar dizzy spells on three separate occasions. His past medical history is significant for a total thyroidectomy 10 years ago for carcinoma. He takes levothyroxine and a multivitamin every day. Several family members seem to suffer from similar spells. At the clinic, his blood pressure is 140/90 mm Hg, his heart rate is 120/min, his respiratory rate is 18/min, and his temperature is 36.6 °C (98.0 °F). On physical exam, he appears quite anxious and uncomfortable. His heart rate is tachycardic with normal rhythm and his lungs are clear to auscultation bilaterally. Small nodules are observed on his buccal mucosa and tongue. The patient is referred to an endocrinologist for further assessment and CT. On CT exam, a mass is observed involving the medulla of his right adrenal gland. Which of the following additional symptoms is associated with this patients condition? A 34-year-old male visits the clinic with complaints of intermittent diarrhea over the past 6 months. He has lost 6.8 kg (15 lbs) over that time period. His frequent bowel movements are affecting his social life and he would like definitive treatment. Past medical history is significant for chronic type 2 diabetes that is well controlled with insulin. No other family member has a similar condition. He does not smoke tobacco and drinks alcohol only on weekends. Today, his vitals are within normal limits. On physical exam, he appears gaunt and anxious. His heart has a regular rate and rhythm and his lungs are clear to auscultation bilaterally. Additionally, the patient has a red-purple rash on his lower abdomen, groin, and the dorsum of both hands. The rash consists of pruritic annular lesions. He is referred to a dermatologist for core biopsy which is consistent with necrolytic migratory erythema. Further workup reveals a large hormone secreting mass in the tail of his pancreas. Which of the following is the action of the hormone that is in excess in this patient? A medical student is conducting an experiment related to body fluids. Part of his research requires a relatively precise estimation of extracellular body fluid in each volunteer. He knows that extracellular body fluid accounts for approximately 33% of the volume of total body water. Which of the following substances is most likely to be helpful to measure the volume of the extracellular body fluid? A 48-year-old man is brought to the emergency department by his neighbor, who found him lying unconscious at the door of his house. The patient lives alone and no further history is available. On physical examination, his temperature is 37.2ºC (98.9ºF), pulse rate is 114/min, blood pressure is 116/78 mm Hg, and respiratory rate is 22/min. His Glasgow Coma Scale score is 7 and the patient is intubated. A stat serum osmolality is reported at 260 mmol/kg. Based on the provided information, which of the following conditions is most likely present in this patient? You are conducting a lab experiment on skeletal muscle tissue to examine force in different settings. The skeletal muscle tissue is hanging down from a hook. The experiment has 3 different phases. In the first phase, you compress the muscle tissue upwards, making it shorter. In the second phase, you attach a weight of 2.3 kg (5 lb) to its lower vertical end. In the third phase, you do not manipulate the muscle length at all. At the end of the study, you see that the tension is higher in the second phase than in the first one. What is the mechanism underlying this result? A 24-year-old woman presents to a physician with recurrent episodes of palpitation, shortness of breath, and perspiration. The episodes are self-limited and are usually preceded by specific social circumstances to which she has a significant dislike. There is no significant past medical history. After a complete history and physical examination, the physician diagnoses an anxiety disorder. He explains that anxiety is associated with the stimulation of the sympathetic nervous system which produces several symptoms related to anxiety such as tachycardia. Which of the following cellular mechanisms best explains the effects of stimulation of sympathetic cardiac nerves on the pacemaker cells in the sinoatrial node? A 16-year-old female patient presents to the physician’s office with an absence of menstruations. Her last period was 6 months ago. Since almost a year and a half ago, she intentionally restricted her diet at the expense of carbohydrates, exercised intensively, and lost 18.0 kg (39.7 lb). She had her menarche at the age of 12 and menstruated normally until last year. She is not sexually active. On physical examination, her blood pressure is 100/60 mm Hg, heart rate is 55/min, respiratory rate is 12/min, and temperature is 35.9°C (96.6°F). Her weight is 55.0 kg (121.3 lb), and her height is 166 cm (5 ft 5 in). Physical examination reveals good development of muscles and decreased adiposity. A bone scan shows decreased calcium mineral deposits. Which statement about this patient’s condition is correct? A young researcher is responsible for graphing laboratory data involving pulmonary blood flow and ventilation pattern obtained from a healthy volunteer who was standing in an upright position. After plotting the following graph, the researcher realizes he forgot to label the curves and the x-axis (which represents the position in the lung). 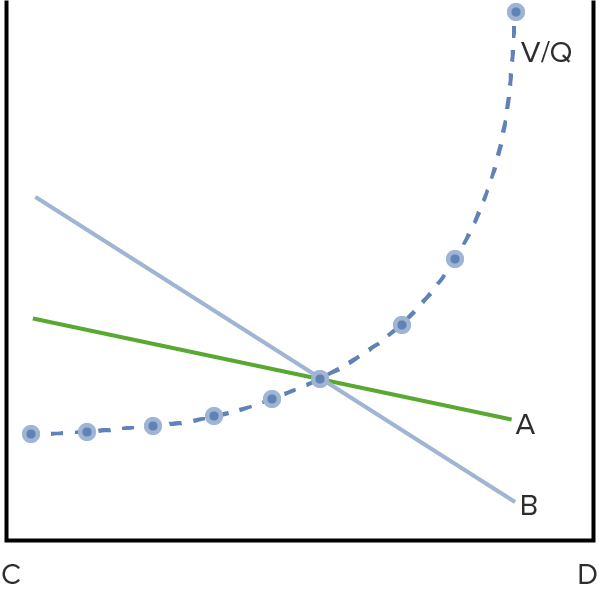 Which of the following is the appropriate label for each point on the graph? 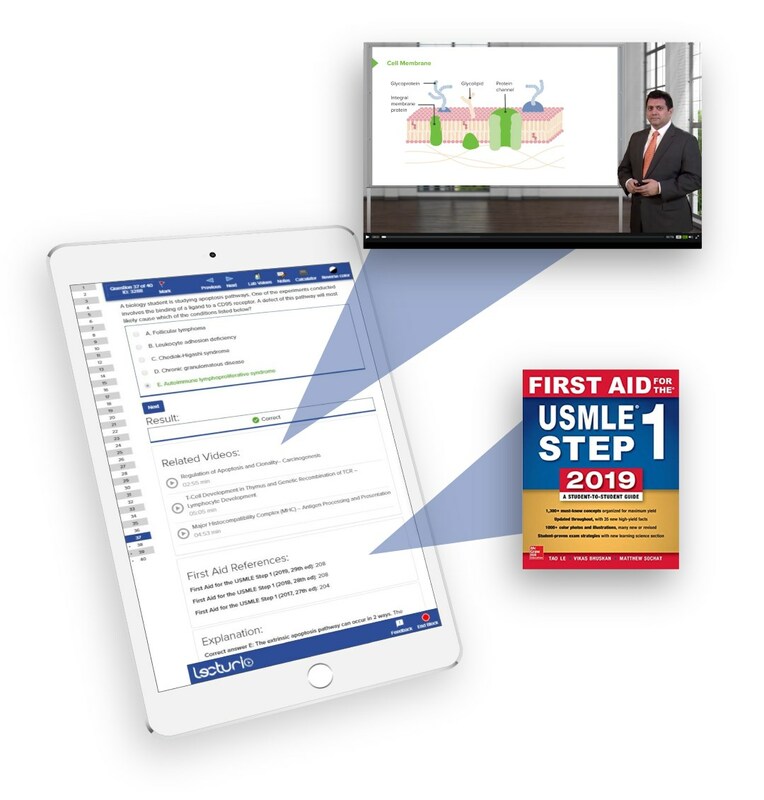 Effectively review the questions' concepts with integrated video lectures and First Aid® references.